Passing by the Prince Street/Marsh Street roundabout, we can see that yes, that strange square in a traffic island really is there for cars. There is enough room for pedestrians though, so maybe its worth leaving as is, though it does screw up lines of sight for turning vehicles somewhat. Look, there is barely enough visibility to see someone cycling through a red light. Which must raise an interesting moral dilemma for all eight readers of the Evening post. Is it better for someone to cycle through a red light on the road, or to cycle along the pavement on the Centre? Having rented a flat in Clifton in times past, one of the oddest things about it was how everyone ignores each other. Whereas in Horfield everyone says hello to their neighbours, in Clifton the residents like to pretend the other residents don't exist. Maybe because they are competing for parking spaces. Here is a car that's had all its tyres let down. Its covered in frost, so was clearly out overnight, and someone decided to penalise it for something. Question is, what? Its corner-ish, but way better than a lot in our dataset. There is room for -wait for it- a small child cycling on the pavement to get along here, without the Evening Post catching them and writing a three page special on this menace to our streets. Usually it is harder than this to get round the city on the pavements. Yet someone has flattened the tyres. Has Clifton discovered militancy? Because if the residents of Clifton start going after cars for minor parking infractions, well, the rest of the city is going to do it properly. More likely is the van behind is boxed in by S419JBD and upset about it. Hopefully -and this is not meant to be taken sarcastically- the tyres were let down and not cut. There is a big difference between mildly inconveniencing someone and costing them a couple of hundred pounds in repairs. Wenesday's Evening Post had a special on city centre cycling, one that has some great photos of trials bikers. They and the BMX riders -here at the project 360 event- are the most skilled riders in the city. They are the best at technical work, better than the downhill MTB Riders who work the Still's Wood trails. They also make for the best videos; the city centre bit of Roam is fantastic, and the bit the little one likes to watch -when I'm not making him cycle along the pavement. The paper's text, under the photos, argued that bikers cycling in a shared use area -the harbour and centre- should actually be banned, somehow from riding a bike. And well they should. Look how much fun the riders are having. That is not the kind of enjoyment we want in a post-capitalist, post-functional-economy, neo-Keynsian country. We want everyone to sit at home in darkness. Its the 1970s way. Three weeks later. It's a bit darker, isn't it? More to the point, the flash makes it hard to read the registration, which ruins the whole datamining aspect of the project. Less photos=less fun; expect a cut back on content. Unless we get more contributions. Photos to traffic at railwaypath.org please, or embrace the idea and take ownership of traffic and parking issues in your area, as Southville Parking have done. One of the new routes proposed for cycle city is a route between Templemeads and the south-east of the city along the river. As you can see, no such route exists today. To be precise, such a route does exist, but it is unpleasant, dangerous and not fun to cycle. The area is built up and you are left pining for such quality infrastructure as the St Philip's flyover, visible in the distance. It is certainly a relief to get off this unpleasant and dangerous path and into the safe cycle facilities around Templemeads. In theory, you aren't meant to park on a corner. 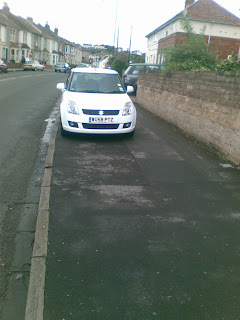 In practise, if you can get your car almost near a corner, then it's parked, especially off Alma Road in Clifton. Here the Peugeot Y86JHU shows that a couple of feet from a corner works ok. It's "corner-ish"
Just after putting the camera away, a white astra with Bristol Parking Services drove by. I did indicate to the passenger that there was an illegally parked vehicle, to see what they would do, but she just mouthed "sorry" and put it away. One experiment we have been debating is to get a white car, put some "Bristol Parking Services" stickers on the side and see if we park unscathed anywhere in the city. But having seen the car this morning, we have a new theory: someone else is running the same experiment. Just think. If you could park where you want just by having BPS sprayed on your car, you'd do it. Maybe if I park over it, it doesn't count? This is on the road between St Andrew's Park and Sefton Park school; there's a zebra crossing a few metres away; this pavement is nearby. And what is on it, a Renault Clio ML51TZV, seemingly parked on top of the sloping bit of the pavement that is there to make pedestrian crossing easier -the bit where the parking rules say it is an offence to block. But here's a thought. If you park your vehicle atop the sloping pavement, well, the slope goes away, doesn't it? Because the bit of the car that is left on the road is no longer blocking a dropped kerb. The bit that you aren't allowed to park against has ceased to be, and so, presumably, the parking offence? Here WN57BVT demonstrates how a SmartCar can find a parking space here in High Kingsdown, where one wouldn't otherwise exist. It may stick out a bit on either side, those inlets may be marked as Keep-Clear, but the truth is they aren't inconveniencing anyone, it's not on the pavement and that keep-clear area has already lost the argument with full-sized cars. All the SmartCar is doing is making it slightly harder for the cars that shouldn't have been parked up on the pavement beside it to get out, like the rover W498WSG and the mini Vo56ULR which serves them right. No doubt when Kingsdown becomes a CPZ, there will be yellow lines everywhere and enforcement of the signage, which will remove a vast amount of the parking capacity of the city. Assuming 50% of the vehicles are parking illegally in Kingsdown/Montpelier, there's going to be a lot of unhappy motorists. This site welcomes contributions from all participants in the Bristol Travel area, and today we are pleased to have a contribution from the Bristol Council section of the Ministry of Truth, here to bring us some current news. Oceania has always been at war with Eastasia. Anyone who believes the enemy was at one time Eurasia is mistaken and should report themselves to their nearest Ministry of Truth office for correctional measures. It is only by struggling with our Eurasian allies that victory over the Eastasian animals will be achieved! The chocolate ration will be increased from 60g/week to 40g/week! The single pedestrian crossing on the Princes Street Bridge will be widened, along with a lane for bicycles to get past. This reduction of car traffic from two lanes to one lane is necessary part of the Bristol Cycling City Initiative. Anyone who believes that there are in fact two narrow pedestrian footpaths on this bridge is a thought criminal. Anyone who proclaims differently in public is guilty of spreading malicious propaganda against the city. Anyone who claims that the proposed Princes Street changes are necessary to permit Bus Rapid Transit bendy-buses to get over the bridge without spending money on new bridges is repeating untruths. Anyone who believes that the announcement was phrased the way it was to put the blame on cyclists or to redirect Cycle City funding towards BRT development is misguided. Please report such subversives to the truth maintenance committee at the council. Grant's Contractors van on it. Grants Contractors are based the other side of the underpass from here -2 minutes walk, 15 minutes drive. If someone does use this as the vehicle to get to and from work, they must want to keep an eye on the vehicle at night, as otherwise it is the slower option. small cars park up on pavement too, and here we see the same behaviour: just because you have a small car, doesn't mean you don't value and want to keep it safe from scratches. 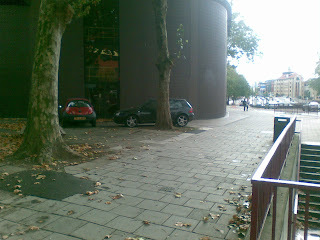 What you can see here is the benefit of small cars: they take up less space on the pavement. Look at the van: almost impossible for Sefton Park schoolkids to get past without stepping into the busy road. 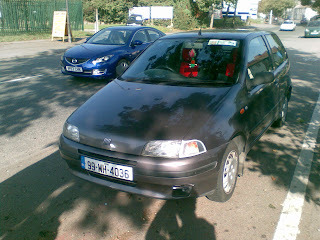 Whereas this little car? They could all dance happily by without even slowing down. It's time for our L-plate photo of the week, here we have a BSM car in Bath Buildings, Montpelier. It has a nice sign on the back, learn to drive, so that anyone seeing the car will think -yes, I should do that, and with these people I will pass my test first time. Of course, KS08KKO is parked on double yellow lines just next to a corner, but we expect that whoever parked the car was clearly aware that they should not be parked here. That's the difference between the qualified teachers and everyone else: the instructors have a better understanding of what rules you have to completely ignore to park anywhere in the centre of Bristol. Now that the term has started, we can see what facilities have been put back in for wheeled vehicles after the summer's building works on Tyndall Avenue. First up the bikes, that have a fairly pretty looking covered bike park. It's not clear how easy it is to secure your bike to the stands, but if the bike isn't stolen, it will be dry. The motorbikes get this stretch of pavement outside the shops and are left to fend for their own security. Why is this? Is that they are just lazy? Or is that after removing the bike/motorbike parking area behind the road, adjacent to the physics building, no parking has been put back. Nope, parking has been put back. But apparently for cars. Again, its because the cars are more important. To merit a Car-Parks-A sticker at the university one must be in a position of power and prestige; lower status people get the parking by Clifton Down railway station and such like. A-sticker people are important enough to be allowed to park close to where they work, so they deserve parking areas while bikes get some temporary covered parking and motorbikes get to push the pedestrians out the way. So now we know whose being lazy, and it isn't the motorbikes. 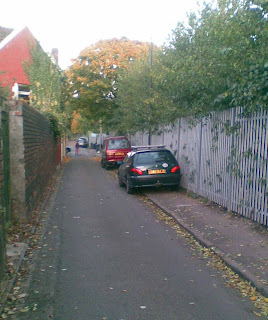 If you're faced with the problem of parking your car in Bristol, just use the many lanes running behind houses. But don't forget to use the pavement and leave room for more cars to get by. I was up the Malago Way the other week and came across an unusual car-shaped obstruction in the middle of the cycle path. It was a bit challenging to get over it on the mountain bike. Now that Bristol has cycling city status perhaps we can look forward to more drivers blocking the cycle paths with interesting challenges for us mountain bikers. This post is brought to you in tabloid-o-rama style which involves highlighting emotional words and phrases in bold text in order to subtly influence the great unwashed masses. Recently the pro-car paper at the 'heart' of Bristol published a full page story about a young girl whose jaw was broken by a pavement cyclist. Of course, cycling on the pavement is illegal. The Post gleefully ran a summary about how much you can be fined for this crime. Funny how they keep barking on about cyclists but seem to have missed these two cars underneath their offices. Isn't driving and parking on the pavement just as dangerous as cycling on it?. 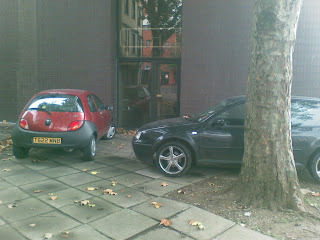 As you can see from the picture, these cars are parked close to a fire door, possibly blocking access in case of a fire. Glad I'm not a Post employee but if I was (and I saw this), I would raise the matter with the Health & Safety officer and have these illegal cars removed. They must have driven up the pavement from the pedestrian crossing or a bit further down. Heaven forbid that they should knock over a pedestrian on their way to park!!. Even when it's perfectly possible to park legally with enough space, Bristolian drivers prefer to use the alternative free car park which used to be known as the pavement. Apparently, the need to protect your wing mirrors from getting broken is greater than access for pedestrians. You'd think drivers would be more familiar with the mechanical aspects of their vehicles and that wing mirrors can be turned in towards the vehicle. Obviously not in this case. What do we have here, on Nugent Hill, on a wet Monday evening? Yes, it's Peter W. of the Save the Railway Path campaign, bringing his daughter back from play school at the top of the hill -where he happened to have downed a couple of glasses of wine. On the way home, he's got the phone out and is discussing what to pick up on the way home. So let's see. Very steep downhill, wet evening, small child on the front, alcohol, and using the phone. Can anyone see what's wrong here? Exactly. He's got rim brakes. Peter, if you are going to do Nugent Hill one-handed in the rain, upgrade the front of your bike to a nice set of hydraulic disk brakes, one that stop just as fast in the wet as the dry, and which will bring you screaming to a halt with only one finger lightly on the levers. Trying to do this kind of thing safely with V-brakes on a wet day is a recipe for disaster. It would be a nice goal to have some cheery photo on a Friday; something a bit less demoralising than usual. A goal -one that will be hard to satisfy all winter. Here though, is sunset from Purdown Camp, by the telegraph tower. Apart from the dogs that like to chase cyclists and terrify small children, there are some good opportunities to put in decent mountain bike trails here. The hard part will be working with the local motorcyle riders, rather than against them. They can be good fun to chase -two teenagers on a small scooter a can be reeled in on the gentle downhill, which provides exercise and amusement. Once the clocks change and the commute takes place in darkness, then this route becomes seriously fun. While looking at Christchurch School's dropoff policy, its interesting to see what they have for bikes and scooters. There is a covered bike park inside the school grounds. Yet look at how insensitive this bike is, parked the one parking on the railings. See? There's only a narrow pavement, yet someone has locked their bike up on them, so denying that pavement to anyone walking to school. This is dangerous and shows a complete disregard of the needs of children walking to school. This is the kind of thing that Cycle City Bristol will only make worse. Christchurch School, Clifton, has some physical no-parking barriers up in front of the main entrance. What to do? Walk in? Or park somewhere else? Well, there's still the corner of the road opposite, with keep-clear signs to keep commuters away. And round the corner, a lovely drop-off point, used by L63FKR, amongst other vehicles. Though the road is a bit narrow, so you do need to get a little bit on the pavement to let the other parents through, as shown by WV06WM0. This is just off the UWE/Lockleaze path: a torched scooter. While it is somewhat wasteful to burn a stolen scooter after one evening's fun with it, improvements in DNA analysis mean that it's the best way to lose evidence. Furthermore, whoever did this was considerate enough to move it off the bike path. This not only means there is nothing in the way of commuters, it means there won't be another melted patch in the tarmac from the battery acid. Looking at the parking in Fremantle Square, it's been clear that either cars drive the wrong way down a one way street to park, or they reverse up it, even though that doesn't make sense. Without seeing any vehicles parking, there was no way to be sure. But as of last week. Evidence. Cars are reversing up one way streets -in the legally allowed direction- to park. We even have it on video. Two only remaining questions. First: why? The sole advantage to reversing up is that it is easier to drive off the wrong way afterwards. Secondly, given we now have proof that cars actually do this, what can we say about parked cars seen parked the wrong way in a one-way street? (car: N754NOJ. Location: whiteladies road). A photo of this came in the mailbox a few months back -here is a return visit to a bit of the centre to see if it's true. Yes, there really is a parking square in the middle of the traffic island at the Princes Street/King Street roundabout. Historically, traffic islands existed to provide a safe place to stand while partway across a road. They provided some safety, without inconveniencing cars the way zebra crossings and pedestrians lights did. For the pedestrian, they meant you only had to run half-way across a two-lane road, and so in busier roads, still cross -provided there were intermittent gaps in either lane. However, there was a price. First, they were a danger to cyclists, as they would force overtaking cars to cut in before the junction. Aggressive cyclists can use islands to their advantage, but you need to be far out and fairly assertive -which means fit. The other flaw with them was that they took away road space from cars. By marking out a rectangle for parking on this island, that problem has been rectified. Bristol has gained one extra parking space! Returning to the name, traffic island, it is still valid. Whereas before it was an island in the traffic, now it is an island for the traffic! This little tactic from France merits attention: avoiding being towed away by disguising the vehicle as something else. Given the DVLA drive round looking for tax disks, and the inevitable CPZ rollout will involve ticketing non residents, there's a lot of appeal in covering your vehicle over with a big sheet in the city. Owners of open-top triumphs tend to have to do this anyway, to keep out the water, so perhaps you could get away with it in the controlled parking areas. There is news that the government wants to create a central database of all owners of disabled parking tickets, to stop theft and forgery of the bits of blue paper that allow you to park where you want. This seems an expensive exercise in creating yet another central database; yet another place to lose personal data. For it to catch forgeries and theft, every time a parking or police officer saw a car with a disabled permit, they would have to check up on the database. This would build an implicit record of the location of every disabled vehicle in the country, which could be very interesting from a datamining perspective, with only a few civil liberties folk to whine about it. Do those people not realise that the War on Terror requires a few personal freedoms to be put aside? In Bristol, we are not convinced that the central database makes economic sense. By allowing everyone to park where they want, even half-in a disabled bay, our city has eliminated the need to steal or forge a disabled parking sticker. Thus we get to save lots of money -on the database, and the enforcement. Isn't that a much better idea? Incidentally, if the government does want to go the database route, we propose RFID-tagged number plates that can be automatically scanned in driveby audits. They would be harder to forge and it would be easier and cheaper to build up a complete database on the movement of people, one the council could get at. As it is today, the ANPR-based national car movement database is not available to the people who be able to use it to find out how people actually drive round the city: the traffic planners. Possible proof that Parking Services do exist: a line of cars with yellow tickets on them. What have such cars as P959APM and YD03ZJL done? This is clearly unwarranted discrimination against commuters. Everyone knows that anyone can park here, it's a parking area close to the BRI and regularly used by medium-stay visitors to the area. Yes, buses do come sometimes, but it is a wide enough road that the bus can park without blocking through traffic. Taxi, sir or madam ? ?